MISSION ESL COMPUTER LAB: "The Grizzly Bear" from Edcon Publishing. "The Grizzly Bear" from Edcon Publishing. Jim Beckwourth will soon fight the animal he fears most. Things you will read about: bowie knife, grizzly bear. 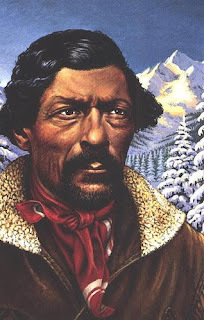 Jim Beckwourth moved quietly in the low timber of the Rocky Mountains. He was a mountain man, dressed like an Indian, with leather pants and a fur hat. Over his back were his rifle and a leather bag filled with dried meat. Looped together on a leather strap were the furs from beavers he had caught in his traps. The beaver skins would bring a good price in the city, but Jim didn't like cities. They reminded him of New Orleans, where life hadn't been much fun for the son of a slave woman. Black men weren't treated well in the cities before the Civil War. Jim had gone off to the mountains, where it didn't matter what color your skin was. The driving snow, the biting winds, and the mountain streams and sunsets were for all men. Jim moved with skill in the dense forest or on the rocky slopes. Around the campfires, when mountain men gathered together, he was respected. Dense clouds were gathering on top of the mountain. A blizzard was forming. He'd have to find shelter soon. Jim's eyes roved around the dense bushes, seeking dry timber to make a fire. He listened to the sounds of creatures moving in the snow. Jim was on good terms with all of the animals of the mountains, except one. That was the grizzly bear, the monster of the Rocky Mountains. No man had ever fought the grizzly and lived. He heard no sound of the terrible creature. Every grizzly was sleeping in its cave. Jim wanted a cave now, too. If he could find one and build a fire, he'd sit out the blizzard like a king. He lifted the bough of a tree and saw a dark hole on the side of a hill. It was a cave, all right. Jim walked carefully to the entrance and looked inside. The cave was deep. His eyes searched the darkness. There didn't seem to be a bear sleeping in the cave. He put his pack down and stretched his tired bones. Then he took out his sharp knife, the bowie knife of the mountain men. Walking swiftly to the timber, he found small, protected boughs which hadn't become wet with snow. 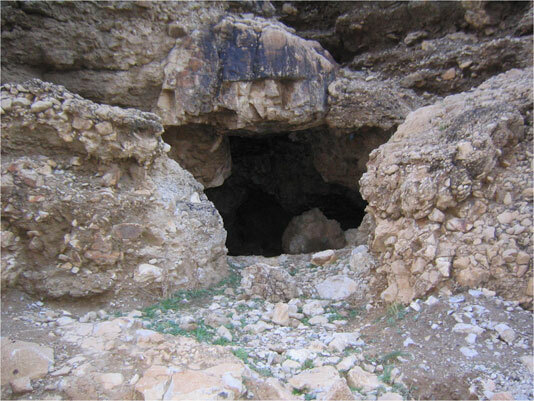 He snapped the boughs into small pieces, made a ring of stones, and built a campfire at the entrance to the cave. The fire was burning and Jim was about to open his food bag, when he heard a sound not far behind him. An enormous form was coming from the shadows far in the back of the cave. The monster, angered at the fire and at being awakened, came toward him. Jim tried to leap backward, but the fire blocked his way. The monster kept coming, snarling. Jim picked up a tree bough and flung it at the grizzly bear, hoping to hit it in the eyes and blind it for a moment. The bough just bounced off the bear's heavy coat. Wildly, Jim thought of how stupid he had been. He should have known that a bear could be sleeping in the back of the cave. Then the bear leaped at him, crushing him to the ground. Its sharp claws tore at his right arm. Roars filled the cave, and the grizzly's teeth shone with terrible whiteness in the glow of the campfire. Jim's strong legs kicked at the animal as he twisted his head to avoid the great teeth. Above all, he had to keep his neck out of the animal's way. The smell of his own blood was mixed with that of the fire and the strong odor of bear fur. Then Jim's mind cleared, and, once again, he became the mountain man, equal to what was presented at any moment. He knew his only hope was his knife, still in his hand. He had to do this just right because there would not be another chance. As he moved his right arm, the pain of the wounds from the bear's claws shot through him. The bear raised itself to crush him once more. Jim drew back the knife. Before the grizzly could hit again with its claws, Jim flung the knife between the monster's eyes. 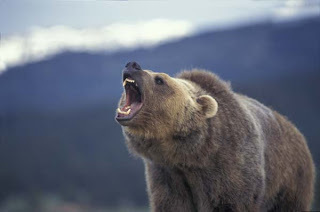 With a terrible roar, the grizzly reared back and fell to the ground. Jim sprang to his feet and grabbed his rifle. To make sure the monster was dead, he fired a bullet into its head. Then pain swallowed him. His bleeding arm was hanging at his side. Jim flung himself down next to the fire and slipped into a deep faint. When Jim awoke, he found the bearded face of his friend Ike staring at him from under eyebrows covered with snow. "Well, I'll be a monkey's uncle," Ike exclaimed. "If you haven't gone and fought the grizzly and won. No man has ever done that before, Jim." Jim's arm healed, but it always had scars from the claws of the bear. And whenever mountain men gathered, they spoke with wonder of "Old Grizzly," Jim Beckwourth, the only man to fight a grizzly and win. c. were afraid of him. a. someone was chasing him. b. a blizzard was coming. c. he had to count the animal skins. d. it was night and he couldn't see. a. he had a stiff neck. b. animals will attack the throat. c. his arm hurt him. d. he needed more room. a. the bear was not in the cave. b. the bear was sleeping far back in the cave. c. smoke from the fire got in his eyes. d. he wasn't looking for a bear. a. into the bear's heart. b. on the side of the bear. c. between the bear's eyes. d. into the bear's mouth. b. "A Fight with a Monster." d. "Camping in the Woods." a. a man hunting for beaver. b. a fight with a bear. c. living in New Orleans. d. how to find shelter in a snowstorm. 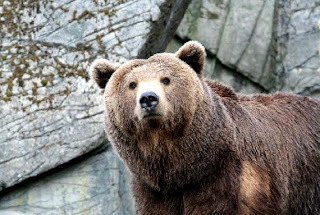 a. a type of bear. b. a type of weapon used by mountain men. c. a very strong snowstorm. d. dark clouds in the sky warning of a storm.